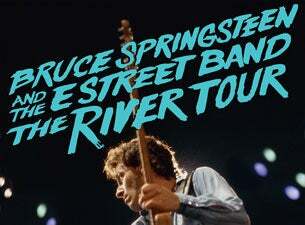 Bruce Springsteen and the E Street Band are regarded as one of the very best live rock acts of all time. From humble New Jersey beginnings in 1972, they grew in popularity to become one of the true icons of American music. Hits such as Born In The USA and Dancing In The Dark cemented Bruce Springsteen as one of America's top popular rock vocalists. He's known for being one of the hardest-working acts in the industry, and concerts can regularly last three hours or more and tours often last years rather than months. Bruce Springsteen began his musical career singing and playing in a number of bands in the New Jersey area in the mid 60s. Influenced by the likes of Elvis Presley, the Beatles and Cream, his musical style was both a reflection of his own musical tastes and of his blue-collar working-class American roots. The mix of old-fashioned rock and roll music with a more progressive, often politically minded lyrical style soon began to build a cult following for Springsteen. By 1972 he was signed to a deal with Columbia Records, along with the E Street Band. The band's members changed now and then over the years, but the core members were Danny Federici, Clarence Clemons, Garry Tallent, Roy Bittan and Max Weinberg. Together they released their first album, Greetings From Asbury Park NJ, in 1972. While they enjoyed tremendous success in the late 70s and early 80s, they were launched into the megastar category with the release of Born In The USA in 1984. The album stormed the US charts, becoming one of the biggest-selling records of all time with over 30 million albums sold. Bruce Springsteen became an American pop-culture icon and the band enjoyed huge success worldwide with sold-out stadium tours and numerous top 10 singles. In 1999 Bruce Springsteen was inducted into the Rock & Roll Hall Of Fame and over the years the act has won numerous Grammy and Golden Globe Awards while continuing to rock at sell-out shows the world over. Bruce has always remained true to his roots, often turning down offers from corporate advertisers wanting to use his music for profit. His music has truly captured the American spirit over the years, which is why he has remained a much-loved and consistently popular musician for such a long time. Away from his on-stage commitments he is an activist for equal rights and runs a charity called The Foundation which helps support war veterans and food banks.